This natural neem oil deodorant recipe is a no baking soda deodorant that won’t irritate skin. Learn how to make your own plus choose from two awesome printable deodorant labels for your own no baking soda neem oil deodorant. 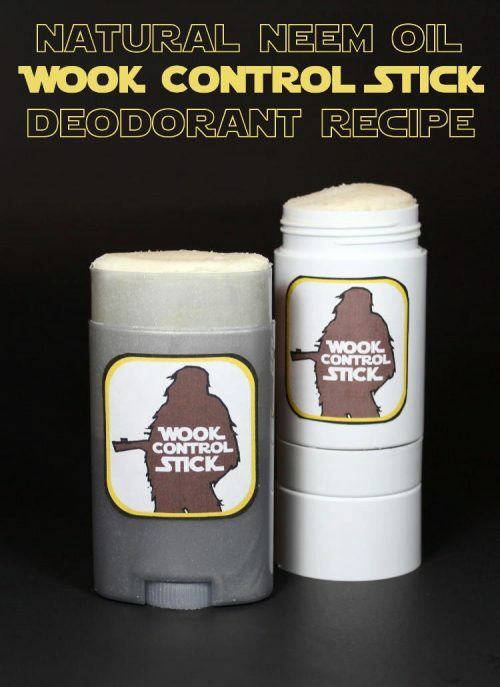 Choose from a Star Wars inspired deodorant label for a Wook Control Stick – a spin on my natural deodorant spray recipe for wookiees – or a basic Natural Neem Oil Deodorant label. Yes! I tested my neem oil deodorant recipe on myself on some pretty hot days over two and a half weeks. And I’m still using it daily! Absolutely! The essential oils used help to fight odor causing bacteria. While they do lend the deodorant a light scent, it’s pretty unisex and not at all overpowering. Plus, the absence of baking soda means no itchy, red pits in a week or so for those of us with sensitive skin. And, it’s vegan. Does it smell like neem oil? Nope. I’ll be one of the first to admit that neem oil can smell pretty awful solo. But you can’t detect any trace of the neem’s natural scent in my neem oil deodorant recipe. Like the essential oils used for this deodorant recipe, neem oil is also fantastic at fighting odor causing bacteria as it’s naturally anti-bacterial. Remove from microwave (or heat source) and weigh out the fractionated coconut oil and neem oil into the melted butter, wax and stearic acid. Stir to combine. Use graduated plastic transfer pipettes to measure out each of the essential oils. Use a new pipette for each essential oil to avoid cross contamination. Stir into the now liquid deodorant base. Set aside. In a separate glass Pyrex measuring cup, weigh out the salt, arrowroot powder and magnesium hydroxide. Mix well to combine. Now slowly pour the dry ingredients into the wet ingredients whisking as you go until the wet and dry ingredients are thoroughly combined. If you are simply allowing your deodorant to solidify at room temperature, allow at least three days for it to reach its final consistency. This is especially important in summer. Once your deodorant has set up, it’s ready to be labeled! 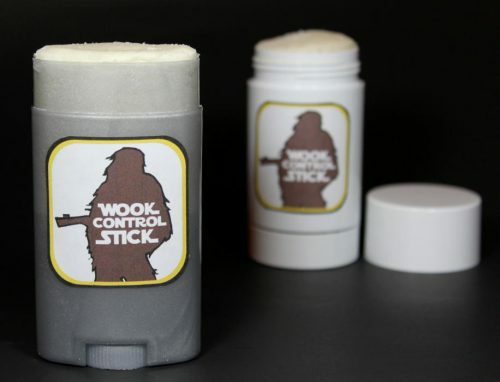 Click here to download my printable Wook Control Stick Labels. Print onto a full sheet white label. Cut out with scissors and apply to your container as desired. Or click here to download my Natural Neem Oil Deodorant labels. Print onto a full sheet white label or, as I have done, print onto a full sheet clear gloss or clear matte label. (I got my labels in bulk for a great price at WorldLabel.) Cut out the labels with scissors, remove the backing and apply to your container(s) as desired. 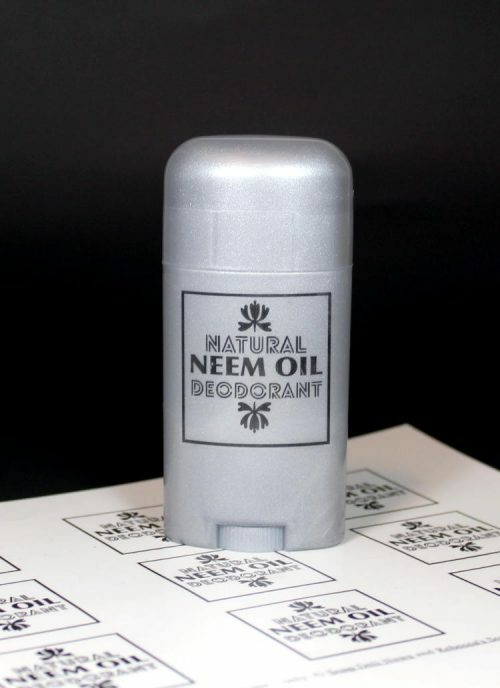 Your natural neem oil deodorant is now ready for use! Simply apply to underarms as needed to fight odor every day. 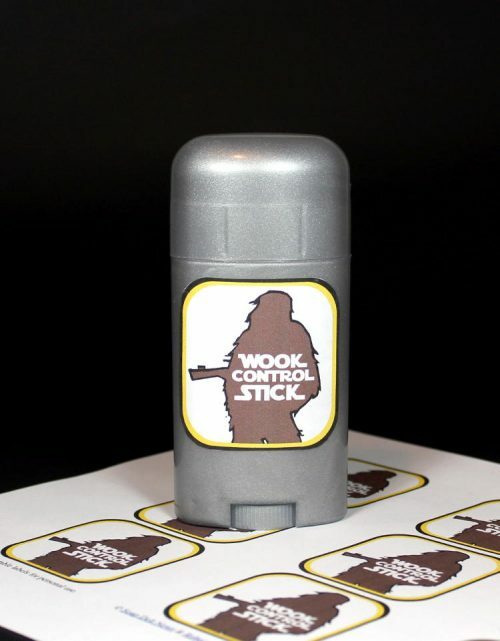 Prefer a jar deodorant over a stick deodorant? Use .1 oz. of emulsifying wax instead of .15 oz. and omit the stearic acid entirely. If you like this neem oil deodorant recipe then you may also like my natural lavender and patchouli deodorant recipe. While this deodorant recipe does contain baking soda, you can simply substitute the baking soda with magnesium hydroxide. You can find that recipe here. For more of my skin care recipes that contain neem oil go here. For more Star Wars inspired projects go here. No time to make your own natural deodorant? Check out All Good deodorants. All Good deodorants don’t contain baking soda. Instead they use arrowroot powder as an ingredient to help absorb moisture and dry underarms. These deodorants also contain naturally-occurring enzymes and essential oils to provide long lasting protection, while aloe vera and certified organic calendula are gentle on sensitive skin. Finally, be sure to follow my boards on Pinterest for more great skin care recipes, printables and DIY ideas. You can also find and follow me on Blog Lovin’, Tumblr, Facebook, Twitter, G+ and Instagram. I love your recipes. And the information you provide for the ingredients. Now I know what to do for that neem oil smell. Thank you so much. You’re welcome. Typically a small amount of eo’s will easily cover the smell of neem. Lemongrass is a good one for covering the scent of neem as well! No, you’ll need to use the fractionated coconut oil which is liquid at room temp. Is there a sub for the magnesium hydroxide? You could try using zinc oxide however it will make your pits white. (I’ve not tried zinc oxide only read about it so I can’t vouch for how well it does or doesn’t work.) The magnesium hydroxide is the sub for baking soda that makes this deodorant work. Without it you won’t have a very effective deodorant.